From farm to film and one side of campus (University of Arkansas) to the other, several departments at the University of Arkansas have collaborated on a documentary highlighting the nation’s strawberry industry. Multiple screenings are scheduled for The Favored Strawberry, which is the culmination of a national project led by the University of Arkansas System Division of Agriculture and its Center for Agricultural and Rural Sustainability. The documentary tracks the four-year National Strawberry Sustainability Initiative, which was funded by the Walmart Foundation. Heather Friedrich in the Dale Bumpers College of Agricultural, Food and Life Science’s Horticulture Department, is program manager, and Curt Rom, associate dean in the U of A Graduate School and International Education, is director. Rom, one of the CARS directors, was a University Professor of horticulture when the project began. 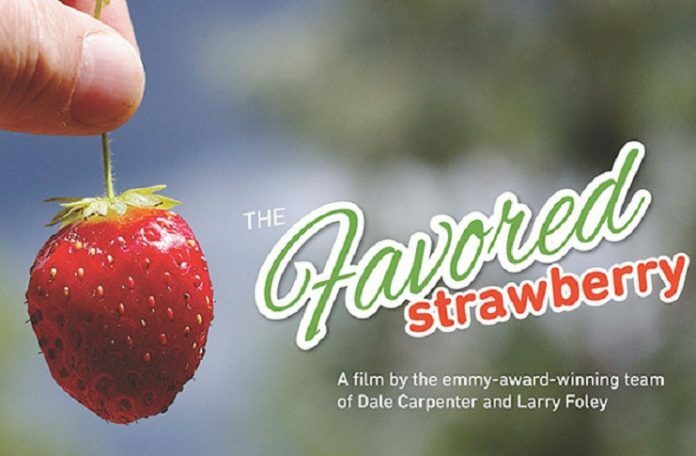 The Favored Strawberry was produced by the Emmy Award-winning duo of Larry Foley and Dale Carpenter. Foley is professor and chair of the U of A Walter J. Lemke Department of Journalism, and Carpenter is a journalism professor. The hour-long film is narrated by Academy Award winner Ray McKinnon. Journalism instructor Hayot Tuychiev is director of photography, associate professor of art Tom Hapgood is the art director and James Greeson, professor emeritus of music, composed an original score. The film includes stories from farms, large and small, where strawberries are picked by hand, one by one. The documentary was filmed across eight states, including Arkansas, Oklahoma, Texas, Florida, New Jersey, North Carolina, Maryland and California. The Arkansas story features local grower David Dickey, following him through every step of the process – plowing, planting, harvest and sales at the Fayetteville Farmer’s Market. The film’s world premiere is March 9 at Plant City, Florida, in conjunction with the Florida Strawberry Festival and a meeting of the National Strawberry Sustainability Initiative project leaders. The film’s showing is sponsored by WEDU, a PBS station at Tampa, Florida. Local screenings are May 2 in Fayetteville at the Botanical Garden of the Ozarks and May 17 at Bentonville’s Crystal Bridges Museum of American Art. Foley is also presenting the documentary at 10 a.m. on May 16 at Concordia Retirement Village in Bella Vista. Other screenings will be announced soon. DVD copies of the documentary will be available through the U of A University Press. The National Strawberry Sustainability Initiative was created in 2013 with a $3 million donation from the Walmart Foundation and an additional $1.05 million donation in 2014. The goal was to move sustainable production forward by focusing on new and proven technology, demonstration, outreach, extension and education. The initiative comprises 26 projects in 13 states, reaching more than 6,800 growers and 4.2 million people nationwide. Results of the project have been summarized in e-books, Moving the Needle: Accomplishments of the National Strawberry Sustainability Initiative 2013-2014, and Success in the Field: Accomplishments of Phase II of the National Strawberry Sustainability Initiative 2014-2015. The Favored Strawberry documentary is the capstone of the project, and will be screened and distributed nationally to increase awareness of the value of strawberries in the agricultural food system and to consumers. Rom and Friedrich received a USDA Specialty Crops Research Initiative Planning Grant to continue the sustainability initiative by developing a future national strawberry research, outreach and education program. Project leaders are meeting with industry leaders from 10 states at the University of Florida Gulf Coast Research and Education Center to discuss a current National Strawberry Production System Assessment Survey and to develop plans for the national USDA project.